Frequently in beauty, theatrical or film work, an actor has color imperfetions, blemishes, stains or other discolorations which require neutralizing or concealing. These two wheels are designed to include the most often used shades for neutralizing, highlighting and concealing used by the professionals in Hollywood and elsewhere. Special thanks to Brad Look for this selection of these colors. 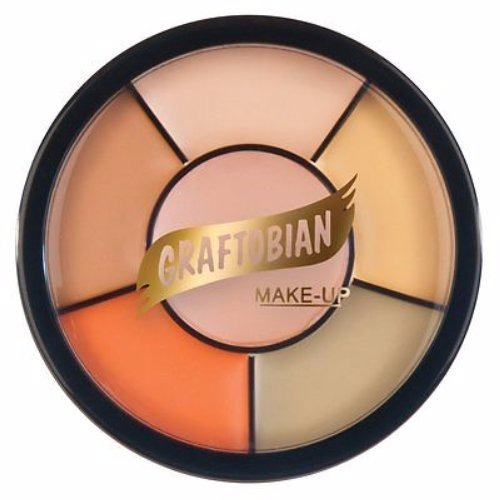 This listing is for a Light skin tone wheel, these shades are formulated with our Theatrical Base, more intense pigmentation than found in even our HD Glamour Creme Corrector Palette which shares 5 of 6 of the Light Wheel shades. This strength of coverage handles extreme discoloration situations as well as Tattoos!